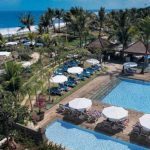 Bali Hotels Vacation Accommodation ideas for staying in Bali Kuta in Indonesia. Everybody looking for some action and fun in the evening goes to “Kuta” which nowadays means the area extending about 4 miles or 7 kilometers North from the original village of Kuta and includes now Legian, Seminyak and even Basangkasa. Here are most of the better entertainment places offering EVERYTHING single male or female visitors as well as couples might be looking for. Jalan Pantai Kuta 10 X, Kuta (Indonésia) • Accommodation. Jl. 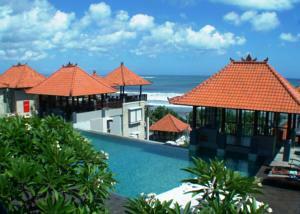 Batubelig Beach, Seminyak-Petitenget, Bali • Accommodation. Grand Balisani Suites is about 13 km from Ngurah Rai International Airport. Seminyak Beach and Canggu Beach are both within 2.5 km from the hotel. Tanah Lot Temple is 25 km away. Bali Hotels. Jln. 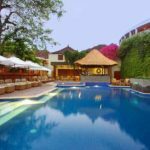 Padma no.1 PO BOX 1107 TBB, Legian (Bali) • Bali Hotels. Boasting views of tropical gardens, 5-star rooms feature private terraces and flat-screen TVs. Padma Bali’s pleasant rooms offer the comfort of classic wood furnishings with Balinese touches and a DVD player. For leisure, enjoy a game of tennis or relax with soothing massages at Mandara Spa. Shower facilities and free refreshments are available at the departure lounge. Have a hearty buffet breakfast or sample Indonesian specialities at Donbiu, which also offers live entertainment. Other dining options include Italian and Japanese restaurants, as well as 3 bars. Bali Hotels. Jl. 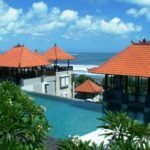 Pantai Kuta, Legian Bali , Denpasar (Bali) • Accommodation. This property is 1 minute walk from the beach. Modelled after a typical Indonesian village, Alam Kulkul Boutique Resort features tropical gardens and antique furnishings. A 5-minute walk from Kuta Beach and steps away from Legian Beach, it offers 2 outdoor pools, traditional spa treatments and free WiFi in the restaurant and lobby. Alam Kulkul Boutique Resort is only 500 m from Kuta Beach. It is a 10-minute walk from Legian Street, which offers several dining, shopping and entertainment options. Denpasar is 8 km away. Decorated in a modern Indonesian style, rooms at Alam Kulkul are equipped with a TV, minibar and tea/coffee making facilities. Private bathrooms come with a bathtub and shower. Some rooms have a private balcony. Bali Hotels. Kuta Beach | Bali, Indonesia :: Surfer’s Paradise. Please visit our website to see additional videos, pictures and on the road reports. Take A Break Holidays takeabreakholiday, Bali Hotels Accommodation. San Francisco De Asis, Urb Marina, San Fulgencio, 03177, Alicante, Spain.